In this picture, 반 밖에 should be 반밖에. There is no space between 반 and 밖에. 라면이나 우동을 시킬까요? Shall we order noodles or Udon? 초록색이나 빨간색을 입으세요. Please wear green or red. A: 어제 술을 얼마나 마셨어요? B: 조금밖에 안 마셨어요. A: How much did you drink yesterday? B : I only drank a little bit. 매달 월급을 백오십만 원밖에 못 받아요. I only get 150,000 Won every month for salary. 일주일에 운동을 3시간밖에 안 해요. I only work out 3 hours a week. 일 년에 한 번밖에 여행을 갈 수 없어요. I only can go travel once a year. 돈이 조금밖에 없어서 비싼 음식을 먹을 수 없어요. I only have a little bit of money, so I can eat expensive food. 이 요리는 아주 쉬워요. 5분밖에 안 걸려요. This food is easy to make. It only takes 5 minutes. 물이 반밖에 남지 않았어요. 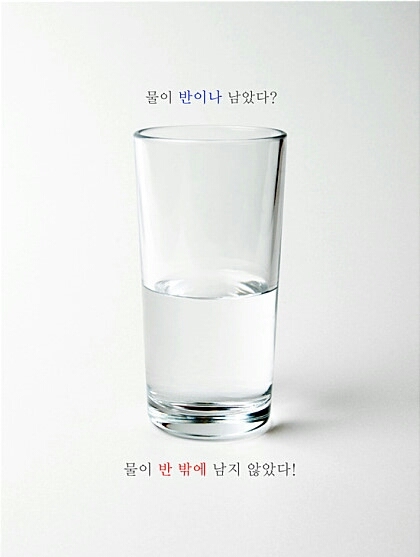 There is only a half cup of water. You can listen to the pronunciation for those examples here.